Same name mountain ski resort and tourist village of Sauze d' Oulx (1.510 m above sea level) above which is located nearly 100 km of slopes is not in itself guarantee excellent skiing. 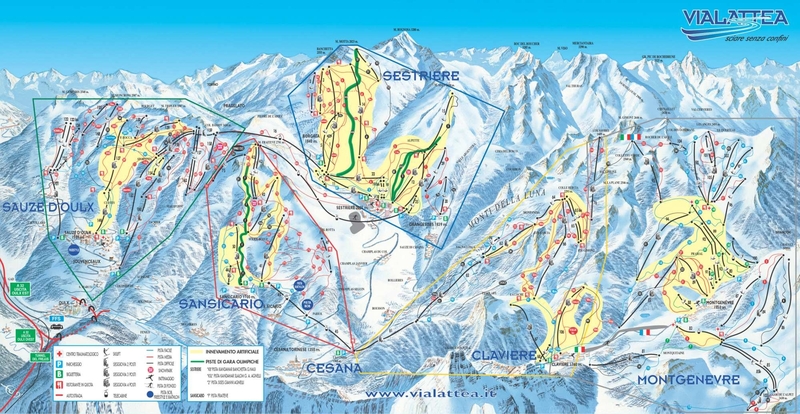 Interconnection with neighboring Sansicario Sestriere and offers 300 km of skiing and to whom that was not enough, the combed through the valley skiing to Claviere and Montgenevre in France. Fortuna Apartments are located in the resort of Sauze d'Oulx, which is part of a larger Vialattea - Milky Way, which was one of the centers of visiting Turin Winter Olympics 2006th The apartments are located in various houses and residences for the Centre near the center. Pleasant Hotel situated 50 meters from the center of Sauze d'Oulx. The family run hotel is situated in a picturesque valley just 10 minutes from the center of the town of Sauze d'Oulx.